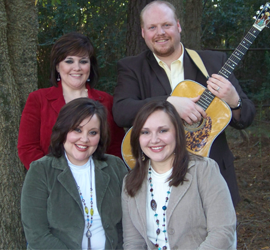 The Sonlight Singers are a family bluegrass gospel group from Amory, MS. We have been singing for the majority of our lives, but started singing as a group in late 2006. The coming together was simply the work of the Lord. On a whim, I brought my guitar to a family gathering. While picking around a bit, I told them of a song that I wished we could all learn as a group just to sing a special at our home church, Rocky Springs Baptist. The song was Allison Kraus and Union Station’s “Jesus Help Me to Stand” (featured on our sophomore CD, In His Hands). We learned the song in a of matter minutes and the following Sunday, we performed the song at church. A couple of weeks later, Bigbee Baptist Church called on Bruce and Barbara Carter (Crystal and Rachel’s parents) to kick off their revival with a singing. Mr. Carter turned to his daughters and asked – “Why don’t you all work a couple of more songs up and sing?” They said “OK”!! At the singing, other area preachers were in the audience. This is when the Lord opened the door for us and laid out what He wanted us to do. After the services were over, 4 preachers came asking for us to sing at their church – both for singings and for specials. Each time we went to a new church, the Lord had someone there waiting for us to take us further. While filling in for a brother in our church at Unity Broadcasting, we were asked to become a regular group on Brother Grady Davidson’s show. We’ve also sung on many of their Saturday night singings. And while on the TV, the phones rang for more places the Lord needed us to go. The Lord has blessed us so much during our time together and we are so grateful. It is an honor to stand before a church and sing to others about what He has done for us. Our prayer is that He uses us as a tool to get His message out – to touch and comfort those hurting – those in need of salvation – and those looking forward to a life eternal with Him. The songs we sing are ones that in some way have touched our lives and we wish to share the blessings with our audience.